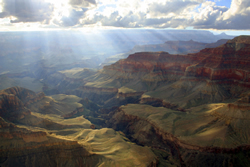 We turn our attention today to the great American West and the region known as the Colorado Plateau. Use this 60-Second Geography article in your own agency newsletters and on your websites. The Colorado Plateau is that area roughly centered on the Four Corners region where Colorado, New Mexico, Utah, and Arizona meet. Formed by the Colorado river and eons of erosion, the landscape of canyons, arches and towers combine to create the national parks of Grand Canyon, Zion and Bryce. of a series of desert basins. One of the finest examples of arid-land erosion in the world, the Grand Canyon offers an excellent record of three of the four eras of geological time, a rich and diverse fossil record, a vast array of geologic features and rock types, and numerous caves containing extensive and significant geological, paleontological, archeological and biological resources. 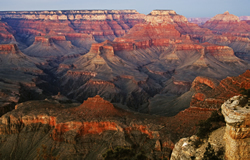 Grand Canyon National Park serves as one of the world’s great ecological refuges, with relatively undisturbed remnants of dwindling ecosystems such as boreal forests and desert riparian communities. It is home to numerous rare, endemic, and specially protected plant and animal species. Over 1,500 plant, 355 bird, 89 mammalian, 47 reptile, 9 amphibian, and 17 fish species are found in the park. Zion National Park is located along the edge of the Colorado Plateau. The rock layers have been uplifted, tilted, and eroded, forming a feature called the Grand Staircase, a series of colorful cliffs stretching between Bryce Canyon and the Grand Canyon. The bottom layer of rock at Bryce Canyon is the top layer at Zion, and the bottom layer at Zion is the top layer at the Grand Canyon. Hidden in the geologic grandeur of Zion are dozens, perhaps hundreds, of freestanding stone arches of all shapes and sizes. 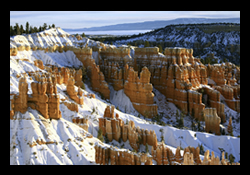 Bryce Canyon National Park spans 2000 feet of elevation and three distinct climatic zones: spruce/fir forest, Ponderosa Pine forest, and Pinyon Pine/juniper forest. This diversity of habitat provides for high biodiversity. 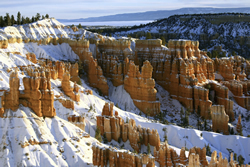 Bryce Canyon’s famous spires, called “hoodoos,” are formed when ice and rainwater wear away the weak limestone that makes up the Claron Formation exposing the rock underneath. Surrounded by deserts, Bryce’s highland plateau gets much more rain than the lowlands below and stays cooler during hot summers. The relatively lush ecosystems that result are like fertile islands towering above a vast arid landscape. © Copyright 2009 Travmarket. LLC. See the Grand Canyon, Bryce and Zion National Parks in a single tour! What is included in the tour price? Virtually everything! Hotels, most meals, all of the activities described in the itinerary pages, airport transfers in select cities, gratuities to hotel porters, restaurant staff and local guides. Caravan’s professional Tour Directors and local guides will be with you every step of the way, ensuring a worry free vacation. Click the icons above to view our video and to see our brochure!